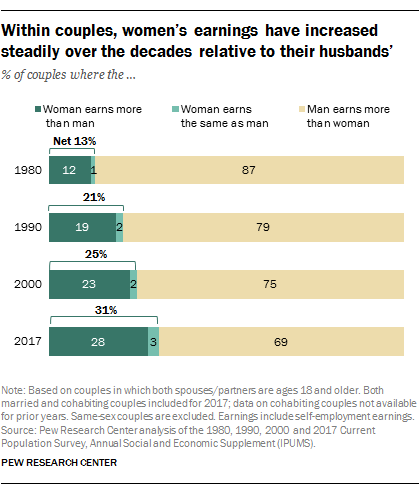 In about a third of married or cohabiting couples in the United States, women bring in half or more of the earnings, a significant increase from the past. But in most couples, men contribute more of the income, and this aligns with the fact that Americans place a higher value on a man’s role as financial provider. Men are especially likely to place a greater emphasis on their role as financial providers. 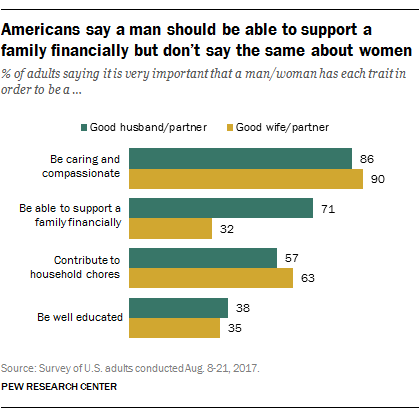 While a nearly equal share of men and women say a man needs to be able to provide for his family to be a good husband or partner (72% and 71%, respectively), men are less likely than women to say the same about women. Just a quarter of men say this is very important for a woman to be a good wife or partner, compared with 39% of women. However, the importance of being the financial provider ranks behind being caring and compassionate when it comes to being a good spouse or partner, in the public’s estimation. Overwhelming majorities say it is very important for men (86%) and women (90%) to have these qualities to be good spouses or partners. The nationally representative survey of 4,971 adults was conducted Aug. 8-21, 2017, using Pew Research Center’s American Trends Panel. As women in the U.S. have increased their labor force participation and earning power, their contributions to household incomes have grown. These trends, along with the fact that women with higher levels of education and income are more likely to marry, have boosted the economic status of married households. Today, married adults are much more likely to live in upper-income households than are non-married adults. At the same time, income dynamics among couples have shifted. In 1980, only 13% of married women earned more than or about as much as their husbands. By 2000, the share had risen to 25%. Today, 31% of women who are married or cohabiting are contributing at least half of the couple’s total earnings (including 28% who earn more than their husband or partner and 3% who earn about the same amount). In 69% of married or cohabiting couples, the man earns more than the woman, though this is down from 87% of married couples in 1980. The relative financial contributions of men and women differ significantly by the educational attainment of each partner. In about half (49%) of couples in which the husband and wife are both at least 25 years old and the woman has more education than her male partner, she also earns at least as much as he does. In 29% of couples where both people have the same level of education, the woman earns the same as or more than the man. That share falls to 20% in couples where the man has more education than his wife or partner. Adults in lower-income families are more likely than those in higher-income families to say being able to financially support a family is very important for making a man or woman a good spouse or partner. For example, 41% of adults with family incomes of less than $30,000 say this is a very important attribute for a woman to have, compared with 23% of those with incomes of $75,000 or more. Blacks and Hispanics are more likely than whites to place a high level of importance on being able to financially support a family when it comes to being a good spouse or partner: 84% of blacks say this is very important for a man, as do 78% of Hispanics. By comparison, 67% of whites say the same. And while 52% of blacks and 40% of Hispanics say it is very important for a woman to be able to provide for a family, only 27% of whites agree. There are age differences as well. Adults ages 65 and older, for instance, are more likely than younger age groups to say that a man should be able to provide financial support for his family. But the different expectations for men and women persist across age groups. Among adults ages 18 to 29, for example, 64% say it is very important for men to be able provide for their family, while 34% say the same about women. Views also differ across demographic groups when it comes to other attributes of spouses or partners. For instance, similar shares of men and women say it is very important for men to contribute to household chores to be good spouses or partners (57% vs. 58%). But men and women have somewhat different views about the importance of this attribute in women. Seven-in-ten women say contributing to household chores is very important for women, while 56% of men agree. Younger adults view contributing to chores around the house as about equally important for men and for women, but older adults are more likely to see this as an important attribute for women than for men. Among adults ages 65 and older, 65% say it is very important for a woman to contribute to household chores to be a good spouse or partner. By comparison, 52% of adults in this age group say this is very important for a man to be a good spouse or partner. As far as educational attainment, men and women overall tend to agree on the importance of a man or a woman being well educated in order to make a good spouse or partner. But college graduates are more likely than those with lower levels of education to say this is very important. Among adults ages 25 and older with a bachelor’s degree or higher, 40% say being well educated is very important for a woman to be a good wife or partner, compared with 30% of those with less education. When it comes to the importance of a man being well educated, 44% of those with a bachelor’s degree or higher say this is very important, compared with 32% of those with less education. Blacks and Hispanics are also more likely than whites to emphasize the importance of being well educated in order for a man or a woman to be a good spouse or partner. About half of blacks (50%) and Hispanics (49%) say that this is very important for a woman, compared with 28% of whites. Similarly, 49% of Hispanics and 45% of blacks say that being well educated is very important for a man, compared with 32% of whites.